Almost two months into our big European cycling adventure we found ourselves in the Romanian capital of Bucharest after cheating the mountains again and catching the train from Brasov (Transylvania). Our *Airbnb host Marco had cycled down to the railway station in Bucharest and greeted us on the end of the platform. The streets around the station are small and busy, the footpaths crowded with shoppers. Marco led us on a merry chase along one-way streets past some pretty amazing architecture. It was tricky trying to keep an eye on him and take in the city at the same time. *Not an Airbnb member yet. Get $25 USD off your first booking by using THIS LINK to join. You get a discount and we get a few bucks to keep us traveling too! Win-Win right? When we reach our apartment, about a kilometer north of the Old Town, Marco informed us we were on the sixth floor – not what we understood from his advert. The stairs leading up were arranged in a very tight, narrow spiral, making even walking up with your elbows out a challenge. Still, there was a lift to take our gear up. Not a problem, surely? Hmmm..The reality was a little bit trickier. It was the smallest, dodgiest lift I’ve ever seen. More like an ancient, open-sided dumb waiter than a lift. We had to stand our bikes up inside and hang on for grim death as the lift clunked its crazy way up six long torturous flights. It would have to be our most difficult introduction to an apartment we’ve ever had. But in the end, after a bit of effort, we were settled into another quite nice place in the center of a major European city which made us pretty happy! I have to admit though, the kitchen was probably the smallest in the western world. It was so narrow you couldn’t enter face on. You needed to sidle in sideways and lean rather than squat if you needed to open the rubbish bin. You couldn’t even bend your knees! Very curious. It was the sort of kitchen you had when you didn’t want a kitchen. Unfortunately, we wanted a kitchen, so we had to make do! 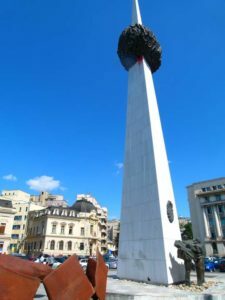 One of our main aims in Bucharest (apart from having a look around) was to contact some Warm Showers people and get some inside information on what lay ahead of us on the road to the south of Romania and onto Sofia in Bulgaria. But first things first. Camera in hand we went out to discover some of the incredible buildings we’d fleetingly seen on the ride from the station. 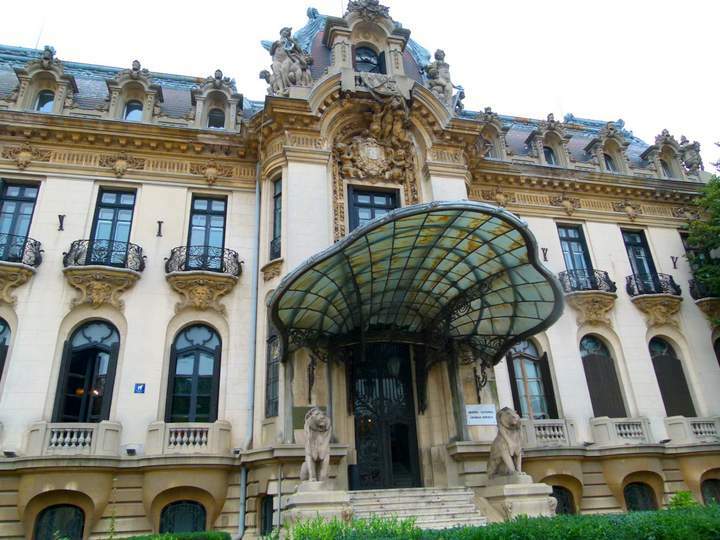 In our wanderings, we come upon one of our favorite buildings so far, the Art Nouveau George Enescu National Museum on Calea Victoriei. Enescu was Romania’s most famous composer, and coincidentally, we had arrived at the beginning of the annual festival in his name. The building is a truly ornate construction. It was a former palace, and one of it’s most distinctive features is the main entrance which is sheltered by an organic, almost fungal-like roof that ensures visitors understand this is a portal that will take you to somewhere special. By far and away the most popular area for visitors it seems is the Old Quarter of Bucharest. The narrow, cobbled streets are chock-full of people patronizing all sorts of cafes, bars, restaurants, wine bars, and a seemingly endless number of the umbrella-covered terraces. It was here we met one of our Warm Showers friends, Paul. He was very keen to take us to a good beer pub, “La 100 de Beri” ( one hundred beers) which we weren’t about to argue with. 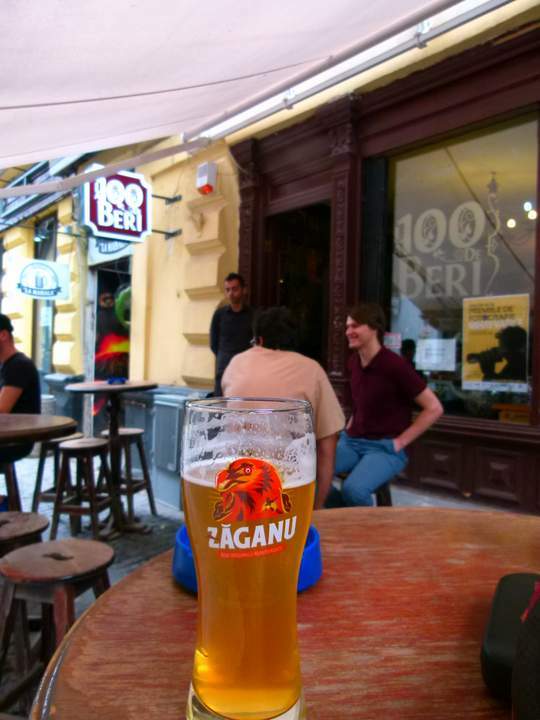 I don’t think they had 100 beers available, but we could sit outside comfortably and ‘people watch’ over a lovely refreshing ale while he filled us in about the road to Bulgaria. He rode that way often and was able to give us some excellent info and tips for the trip. He also took us to a fabulous wine bar where we sampled some of the more famous Romanian reds while a very well-informed bloke talked us through it. With a name like Dionysis, you know it was going to be good. Sharyn was in heaven. Romanian wine is meant to be pretty good apparently! She seemed to think so. We haven’t been here long, but it’s clear that Romanians are very passionate people and are keen to teach you about all aspects of their lovely country. If only all the countries we visited had such warm, inviting people like this. 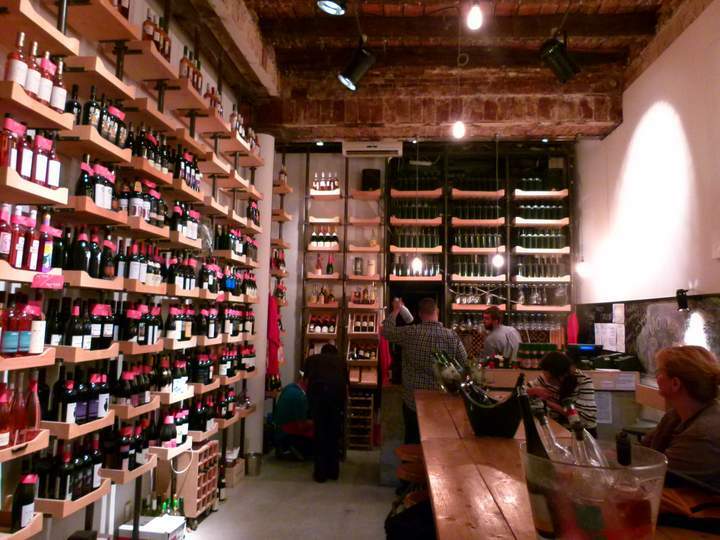 Dionysus Wine Bar…Shazz’s seventh heaven. We even managed a couple of craft beers at a bicycle repair shop! Indeed a specialist kind of place and we understood it perfectly! Our Warmshowers contact, Anna, rode through a “tropical” downpour to meet us in this very hard to find cafe. Atelier Pinion is really only known to cyclists in Bucharest, but here we were waxing lyrical, in English, with these lovely young people making a go of their small, niche venture. We met them again the next day at the Bicycle Festival in Parcul Izvor, a large greenspace adjacent to the Old Quarter. Considering Bucharest streets aren’t really set up for bicycle traffic, a pleasing number of cyclists turned up to the two-day event riding all sorts of rigs. We should’ve bought Radmilla and Sakura down as they would’ve been the only touring bikes there and would have generated a bit of conversation with the locals. Nowadays, it’s all about mountain bikes, whether you’ve got mountains or not. Still, it was fun to watch the trick riders with their tiny, seatless, single gear bikes go over an almost impossible obstacle course. The Palace of the Parliament is HUUUGE! 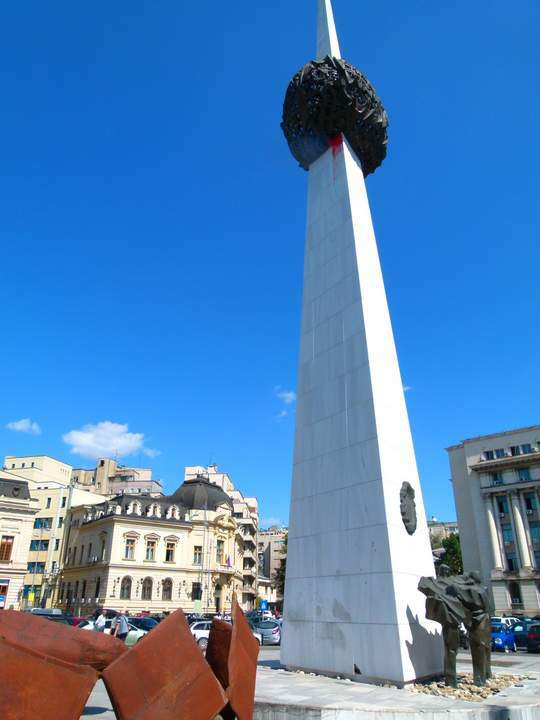 The park was right by one of the most famous landmarks in Bucharest. 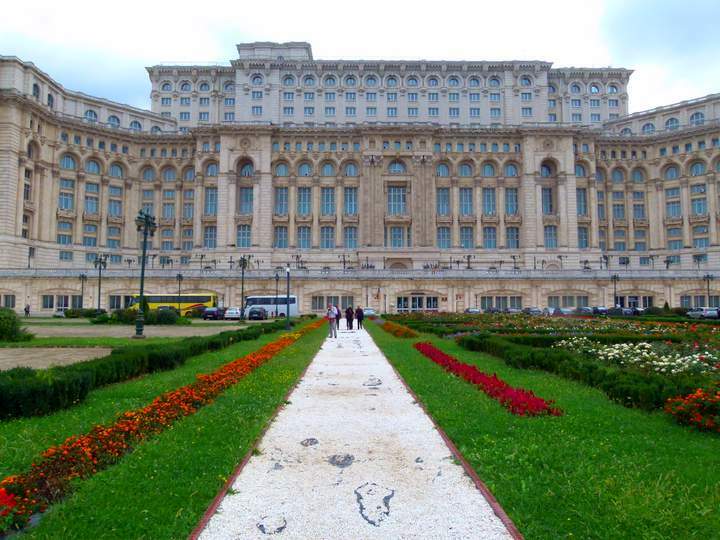 The ridiculously huge Palace of the Parliament (AKA the People’s Palace) that was commissioned and built by one of Romania’s more notorious leaders, Nicolae Ceaușescu. Handy fact; It’s actually the heaviest administrative building in the world, and in 2008 it was officially the most expensive valued at a massive 3 billion Euro. In 1990, Aussie Rupert Murdoch tried to buy it for 1 billion dollars but got knocked back. It’s hard to decide just who had the biggest ego…Nicolai or Rupert!! 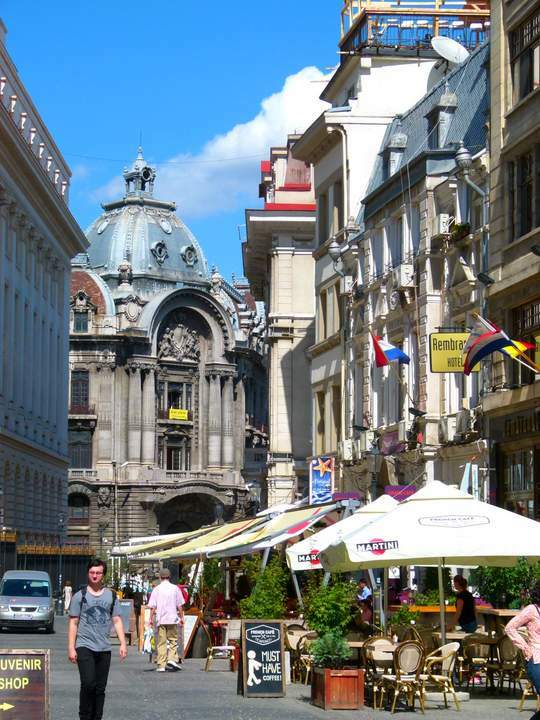 Bucharest is certainly worth a few days visit, and we would recommend a few more if you have the time. This historic city has a charm that compels you to linger and meet more of the locals. Romanians are definitely some of the nicest people we’ve ever had the pleasure to meet on our travels. 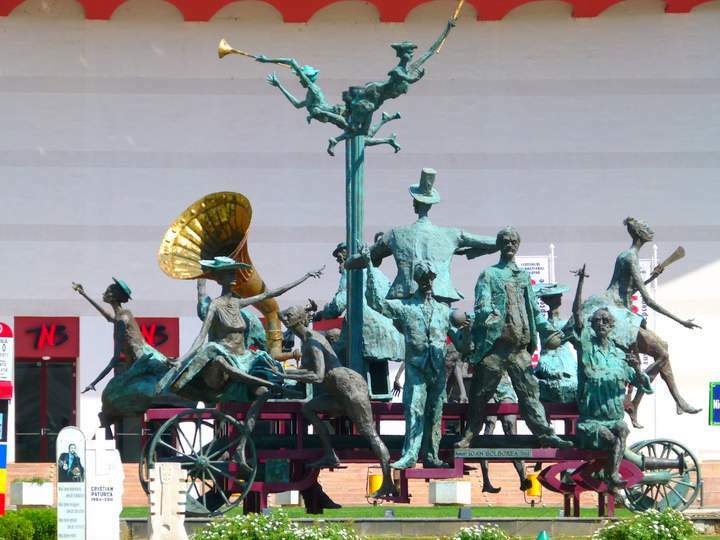 Some impressive statues adorn the city center. As we plotted our exit from Romania we were delighted to find a bike path on the footpath of the main road heading south out of the city. It meant dodging a lot of pedestrians, illegally parked cars, and the occasional dog sleeping in our way, but it certainly was welcome and saved us playing chicken with the busy traffic. On the outskirts, a soldier flagged us down. I ignored him but Sharyn pulled up. It turned out he just wanted to chat. We got the usual “where are you from, where are you going etcetera.” We’re usually very wary of police and military types, but he was exceptionally friendly and curious. I think we made his day!! The road to the border on the Danube is nothing to write home about, but it was our first time back on the bikes for a couple of weeks and much-needed. We cycled 73 kilometres to Ruse in Bulgaria over the dodgiest bridge we’ve ever been on – but that’s another story! Note: This post is now available as a GPS Guided Travel App. 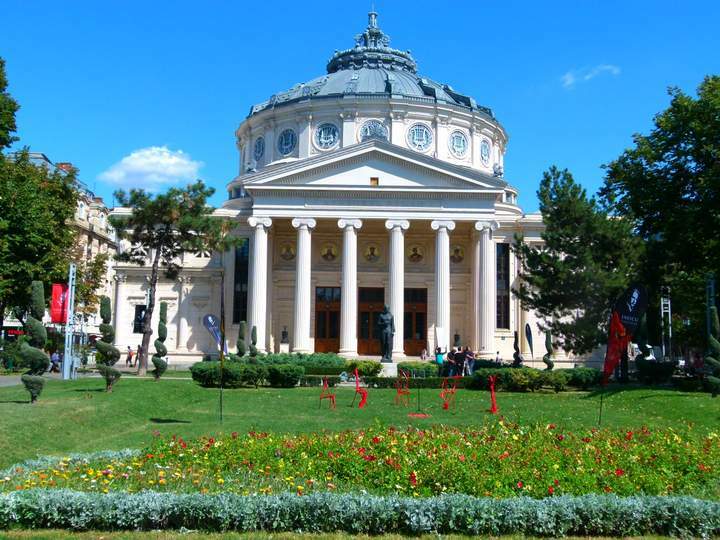 Get the most out of your visit to Bucharest and DOWNLOAD it for free HERE. Next story Ruse – Bulgaria, A Pleasant Surprise!